I made this bracelet years ago, and only realized recently that I never told you how it was done! Since it's now officially spring in New England, it seems like as good a time as any to share it. I don't have any in-progress shots, but it's so easy, I think we'll get by this time without them. 1. Find some buttons that you want to use together on your bracelet. I chose two silly little flowers, two vintage bling-bling buttons, and three button blanks that I could dress up. You can find these blanks at any fabric store and most craft stores. 2. Choose fabric that matches your theme. My theme was happy silly bling...can you tell? Cover the buttons according to the package directions. 3. 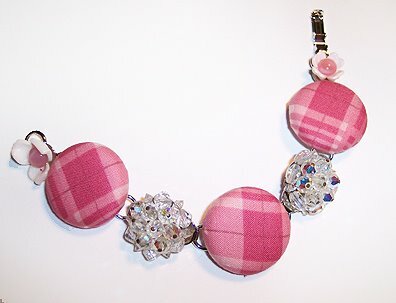 Using thin craft wire, two-part resin, or both, attach your buttons to the platforms on the bracelet. I used wire since my buttons were all shank style, but then I also added a drop or two of epoxy for extra security. You do come up with interesting 'projects' for us, don't you!! !